No, that is not a typo. No, you are (probably) not suffering from a stroke. Neither am I. 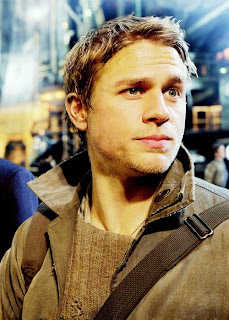 Yes, I am really referring to Charlie Hunnam's character from Pacific Rim, the alarmingly dude-shaped Raleigh Becket. He's a strong female character. And it's great. So what do I mean when I say this? Well, obviously, Raleigh isn't technically female. Not in the physical sense, at least. He does not identify as a woman that we know of, nor does he exhibit any strong feminine traits. At least, not externally. Dude goes from being a street brawler to a cocky Jaeger pilot to a welder - all traditionally very masculine jobs and roles. To top it off, h'e a dude's dude, always talking about the mechanics of his Jaeger, Gipsy Danger, and slightly prone to getting into unauthorized fights. All of which doesn't sound all that stereotypically female. I know. But Raleigh does exhibit other traits, ones much less on the surface, and those traits, while not exclusively female, are more traditionally feminine in nature. What I mean is, out of everyone in the movie, Raleigh, not Mako, is closest to our understanding of the "strong female character" trope. And that's awesome. For those of you who haven't yet seen Pacific Rim, here's a quick rundown. In 2013, Earth was first attacked by giant monsters that climbed out of an interdimensional rift in the Pacific Ocean. At first, these mega-godzillas devastated our shores, but the world quickly banded together to fight the threat. The solution? Giant robots, called Jaegers, which can fight the monsters, now dubbed Kaiju. The Jaegers are so massive that they need too pilots to "share the neural load" and for plot related reasons, the pilots have to be linked mentally to each other and the machine, so that they can work perfectly in sync. Yeah, it's a bit to get through just so we can start the story, but don't worry. It's worth it. Also, beware. This is gonna be SPOILERIFIC. The film picks up seven years into the Kaiju War. 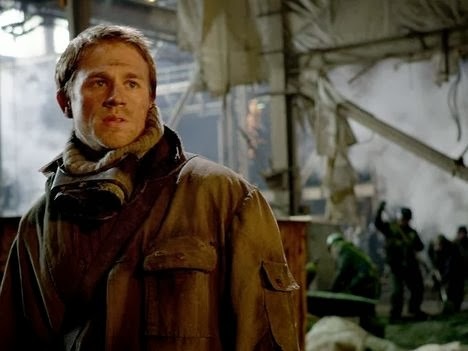 Raleigh Becket (Charlie Hunnam) and his brother Yancy (Diego Klattenhoff) are Jaeger pilots, and some of the best. Cocky, charming, and completely assured in their abilities, the boys charge out into the night-time Bering Strait to face another Kaiju - the biggest one ever spotted. They lose. Hard. Or rather, they win, but at a terrible cost. The Kaiju is both larger and stronger than they've ever faced, and as a result, they underestimate it. During the fight, it manages to tear off an arm of their Jaeger (which means that Raleigh experiences the sensation of having his own arm torn off), and then bites into the Jaeger's head and straight up eats Yancy. Raleigh manages to kill it, but only barely. He pilots the Jaeger back to shore and then collapses. Cut to five years later. The once thriving Jaeger program is on the brink of collapse. Raleigh has faded into obscurity as a drifting welder working on an anti-Kaiju wall, and the world is about to end. So naturally it's right then that Marshall Pentecost (Idris Elba), head of the Jaeger program, finds Raleigh in order to recruit him for an end of the world mission to save the planet. The clincher? "Haven't you heard, Mr. Becket? The world's coming to an end. So where would you rather die? Here? Or in a Jaeger." There's just one problem. Raleigh was still in "the Drift" with his brother when Yancy was eaten, and that kind of mental scarring doesn't just go away. He's leery of having someone in his head again. It seems like the central emotional story of the film is clear. Raleigh will struggle to trust someone enough to pilot again, pulling it together, after a few hours of brooding, just in time to save the world and get the girl. Right? Well, no, actually. Raleigh comes to the Hong Kong Shatterdome with the expectation that he can't let anyone back in, a belief that lasts about five minutes. Because immediately upon arrival at the Shatterdome, Raleigh meets Mako Mori (Rinko Kikuchi), Pentecost's adopted daughter and a potential Jaeger pilot. Immediately, Raleigh changes his tune from "I'm not sure I can let anyone in my head again," to "That's her, she's perfect, everyone in the Jaeger, let's go fight some Kaiju!" It's shocking, and fast, and completely not the characterization you expect. In fact, the central emotional story of the film turns out not to belong to Raleigh, but rather Mako. An orphan of the Kaiju War, Mako wishes desperately to become a pilot in order to avenge her family, but is deemed too angry and emotionally volatile to make a good pilot. As it turns out, it's Mako, not Raleigh, whose grief and rage endanger their connection, and it's Raleigh's job to emotionally balance her out and soothe the tempers around him. This is what I mean when I say that Raleigh is a "strong female character". Raleigh's role in the film is that of friend, counselor, and emotional support - commonly the role given to a girlfriend or wife in a movie like this. He's the Peggy to Mako's Captain America, the Jane to her Thor, the Katara to her Aang. Raleigh is the supportive, emotionally intuitive counterpart to his impulsive, rash, and angry best friend. His journey is over in the first twenty minutes of the movie. Hers has just begun. Part of what makes this film so remarkable is Raleigh's complete lack of macho behavior. When verbally baited, both by a socially inept scientist (Charlie Day) and by an antagonistic pilot (Robert Kazinsky), Raleigh responds with honesty and tact. He's calm, even when angry, and more in tune with the emotions of those around him than anyone else in the movie. The only time we see him react in anger is when the jerk-face pilot, Chuck, attacks Mako, and this particular scene actually feels rather out of character. Not only this, but Raleigh is supportive to a degree rarely seen in action films at all. Upon finding out that Mako wishes to be a Jaeger pilot, his reaction is not to offer advice or criticism or anything about himself. Instead, he just tells her that he's sure she will be. Even after she insults him and his actions, his response is still not to denigrate her dream. Rather, he says, "Well, thank you for your honesty. You might be right. But one day when you're a pilot you're gonna see that in combat you'll make decisions, you have to live the consequences. That's what I'm trying to do." Yeah. That's what he says when he's insulted. I am ninety-five percent sure that I have never been that nice in my entire life. Ever. It's crazy. And when Raleigh realizes that Mako could be his co-pilot, he is fierce and relentless in his efforts to get her in the role she dreams of. He argues with Marshall Pentecost. He faces down Chuck. He even argues with Mako, insisting that she follow her dream. Throughout all of this, the message is clear: I support you. You matter. Your hopes and dreams and feelings matter. When she shuts him down, Raleigh leaves her alone. When he and Mako fight, he doesn't go easy on her, but he's thrilled when she beats him. When Mako screws up their trial run, Raleigh is the first one demanding that they get another try. Basically, Raleigh, far from being a macho manly man dealing with his inner angst, is actually a cheerleader campaigning for presidency of the Mako Mori Fan Club. Like I said above: none of these are actually gendered traits. Raleigh is supportive, but that's not a women-only kind of thing. Lots of men are supportive. And he's emotionally engaged as well, but that's not an exclusively female trait either. Not in reality. But in movies? Yeah, kind of. Most movies, especially big-budget action flicks like Pacific Rim, the women are supportive and the men are emotional time-bombs. It's so incredibly rare to see a man like Raleigh, who is both fully male and also incredibly feminine. Because that's what these are. These are traditionally feminine traits, portrayed by a dude who likes to walk around with his shirt off. And isn't that what feminism is about, really? The right for women to pursue avenues traditionally held for men, and the right for men to pursue lives traditionally reserved for women. It goes both ways. Raleigh's femininity in no way diminishes him as a character. In fact, it serves to enhance, and when combined with Mako's masculinity, it makes them an unstoppable pair. Their partnership is built on their compatibility, and the fact that neither of them is cookie cutter masculine or feminine is just another part of that. So, yes. Raleigh Becket is a Strong Female Character. Sure, he's not female, but as far as our understanding of SFCs goes - which here means well written female and feminine characters - he's aces. 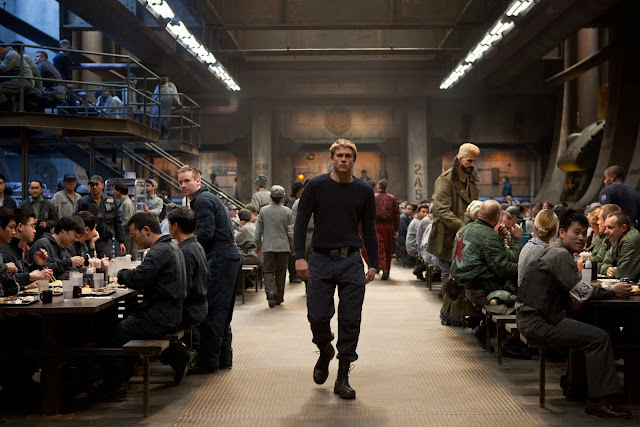 Raleigh Becket is supportive, sweet, intuitive, and loving, and there is absolutely nothing wrong with that. Not a damn thing. I agree with this so much. 'Cause he totally is a feminine character and it's awesome. It's also awesome that Mako is a masculine female character and nobody ever makes fun of her for that or demeans her for it. It's a movie where gender roles are less rigid and that's why it's one of my favorites.